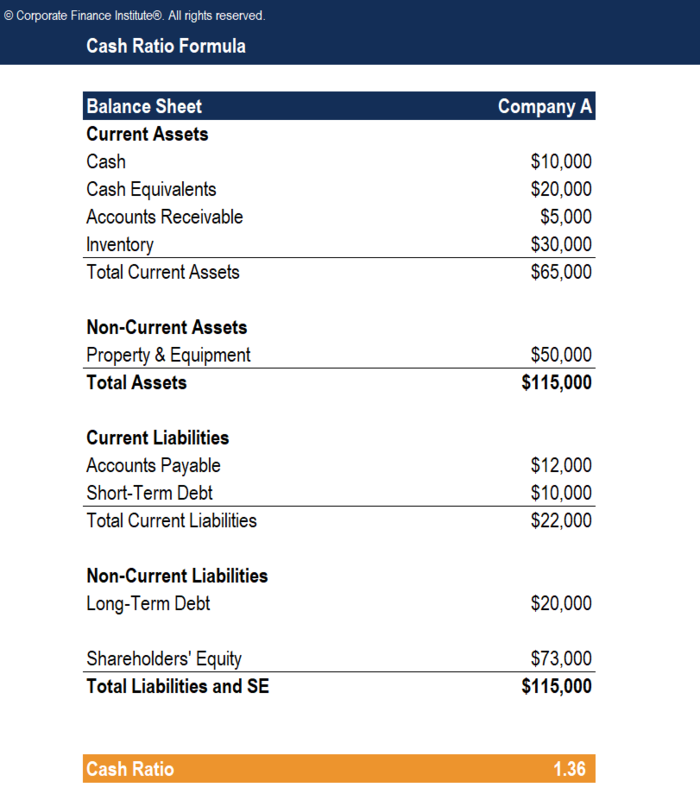 This Cash Ratio Template will show you how to calculate the cash ratio which measures a company’s ability to pay off short-term debt obligations with cash and cash equivalents. The cash ratio, sometimes referred to as the cash asset ratio, is a liquidity ratio that measures a company’s ability to pay off short-term debt obligationsCurrent LiabilitiesCurrent liabilities are financial obligations of a business entity that are due and payable within a year. A company shows these on the balance sheet. A liability occurs when a company has undergone a transaction that has generated an expectation for a future outflow of cash or other economic resources. with cash and cash equivalents. Compared to other liquidity ratios such as the current ratioCurrent Ratio FormulaThe Current Ratio formula is = Current Assets / Current Liabilities. The current ratio, also known as the working capital ratio, measures the capability of a business to meet its short-term obligations that are due within a year. The ratio considers the weight of the total current assets versus the total current liabilities. and quick ratioQuick RatioThe Quick Ratio, also known as the Acid-test or liquidity ratio, measures the ability of a business to pay its short-term liabilities by having assets that are readily convertible into cash. These assets are, namely, cash, marketable securities and accounts receivable. These assets are known as "quick" assets since, the cash ratio is a stricter, more conservative measure because only cash and cash equivalents – a company’s most liquid assets – are used in the calculation. The cash ratio indicates to creditors, analysts, and investors the percentage of a company’s current liabilities that cash and cash equivalents will cover. A ratio above 1 means that the company will be able to pay off its current liabilities with cash and cash equivalents. Creditors prefer a high cash ratio as it indicates that the company can easily pay off its debt. Although there is no ideal figure, a ratio of not lower than 0.5 to 1 is usually preferred. The cash ratio figure provides the most conservative insight into a company’s liquidity since only cash and cash equivalents are taken into consideration.